Carnival is known for its masqueraders and this year you’ll have to squeeze every creative juice out of your brain to win these prizes. Creativity, appearance, and WOW factor will decide the winners. There is no registration required, just come party and enjoy. The WILDEST Caribbean costume is an individual contest. One winner will win $1,500L. The King & Queen of carnival are individual contests. Both will win $1,500L. The big one is the Best crew in Caribbean costume contest. This is a group contest which requires five or more members in a crew. The crew who wins this contest will win $3,000L! It has to be noted that if you win any contest, you are ineligible to compete in any other contest during the event. The staff of Sunburst Premier Grid Entertainment is ineligible to participate in the individual contests. Our sponsors are eligible to enter any of the contests. Winners will be determined by judges. We will also have random prize giveaways during the day. Music this year will be provided by five dancehall/soca deejays including previous and new talent for this year’s lineup. They include: DJ G-Rock, DJ Seleckta Key, DJ Socaholic Trini, DJ Apple, and DJ Infinite. All are excited and ready to heat up the beach at carnival. Carnival this year will be on Chatham Light Beach, Cape Cod on the Sunburst Estates sim. http://maps.secondlife.com/secondlife/Sunburst%20Estates/142/122/2 . 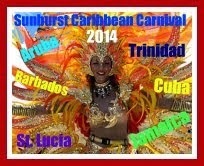 It’s all about celebration of the Caribbean culture of dance and music. Come in costume prepared for the beach and enjoy yourselves. Thank you all and see you at carnival! Shon Larsson, Owner/CEO, Sunburst Premier Grid Entertainment and The Blazin1.FM radio.